Secreted away downtown, after-office bar Le Merval tends to become an instant favorite for those who discover it. 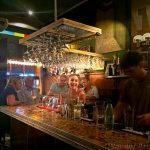 Due to its location on Viamonte street, which is central but not in the thick of the bar action on Reconquista, it doesn’t receive much passerby traffic as nearby watering holes. It is tucked away in a little plaza, which means there is outdoor seating when the weather is nice. Le Merval has the usual happy hour specials, but what sets it apart is its ‘stock market’ price list. It’s a concept that originated in Belgium, spread to other countries around the world, and has been introduced to Buenos Aires exclusively by Le Merval. The idea is that you have a constantly changing price list, which fluctuates depending on what drink people are buying. Three plasma screens display the current prices and are refreshed every six minutes. For example, if a group of people decide to all buy shots of tequila, the next time the board refreshes, tequila prices will probably have gone up, while other drinks in the ‘shooters’ category will have dropped in price. The game can be a little annoying for the kind of person who likes to stick to the same drink all night, because you are never sure how much the next round is going to cost, but for those who don’t mind trying a few different drinks, it can be a lot of fun, and also is a way to save money if you play the game well. Needless to say, drink prices at Le Merval can vary quite considerably. A bottle of beer can double in price in minutes, so it pays to keep one eye on the screen. Aside from this fun gimmick, Le Merval has all the things you need from a good bar: friendly, skilled bartenders, a wide range of drinks, and a resident mix-master, DJ Lucky on weekends. Le Merval is owned and run by three Frenchman; Stephan Gouyer, Adrián Bonachera y Frederic Dath, who ensure the atmosphere is always cosmopolitan and congenial. With a large following of regular customers with both French and American backgrounds, some nights you may for a moment think you are in Paris or New York, especially if you have already consumed a number of the nicely mixed Mojitos on offer. Nightly themes include ‘Gay After Office’ on Thursdays and ‘Ladies Night’ on Wednesdays. Le Merval also specializes in hosting birthdays and other parties, which can be pre-arranged with the owners.